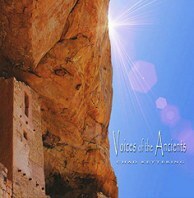 Chad Kettering's latest release Voices of the Ancients is filled with the pulsing rhythms of ancient tribal rituals and the hypnotic chants that act as a beacon to the deeper aspects of the listener stirring awake those emotions and feelings that have been forgotten by civilization through the passage of time. I guess it is the way of life that as we evolve as human beings those experiences that were important to our ancestors tend to be left behind and replaced by new rituals and rites of passage that seem just acceptable to us and our generation. Chad's new album is a reminder that buried within each of us are remnants of these old ways and music such as Voices of the Ancients is one way to stir those embers of long neglected fires to life and experience what our ancestors must have felt as they allowed the drums and the chants to carry them away into altered states of consciousness. Chad has spent the better part of two years allowing the music of Voices to gestate and mature within his mind and spirit so that when he finally brought it all together as the 8 tracks that comprise this album they would no longer be just a collection of songs related only by the fact that they are on the same CD but rather they would mesh as a complete statement and speak to the listener with more power than they would have as individual tracks. I think that with albums like this one would do well to take it as a whole and set aside time to listen to it uninterrupted all in one sitting and not try to pick songs piecemeal off the album to listen to as individual tracks. Its not that you can't listen to the songs on this album ala carte but it does tend to diminish the overall effect when you do so. The album is a mixture of musical styles (tribal drums and chants, soaring synths) that all work together to communicate the theme of this work which is a spiritual journey such as a shaman might take during a ritual to discover the deeper aspects of their life and to understand how those hidden parts of oneself might be brought to bear on their day to day living. Chad's music follows a typical kind of pattern when it comes to ritual starting with the drumming and the chants that help the participant of the ritual or in this case the listener to separate themselves from their daily lives and to step into a realm that allows them to see inside themselves without all the filters that modern humankind places upon their perceptions of their life and spirit. Voices of the Ancients also allows the listener time to quietly sit as the tribal drum beats give way to otherworldly and densely atmospheric sound worlds so the listener may contemplate what they have found once they were able to reach inside themselves and examine the person that lies within. Chad's music is a sonic delight and shows very clearly that the time he spent tweaking it over the past couple of years was time well spent. The use of voices, some natures sounds and especially the crackling fire on the last track evokes images of sitting around an open flame under a starry sky while the drums and the chants touch parts of the spirit that seldom see the light of day. Voices of the Ancients delivers the goods while interweaving desert ambience with some invigorating drumming and some soothing synths as the listener is drawn along on this shamanic journey of discovery. To those of us in the modern age this music would be mysterious but it will also be strangely inviting as our forgotten natures are brought a little closer to the surface. Chad has shown that he is a highly talented musician with the release of this album and that he is a great storyteller as well. Listeners will find not only enjoyable music but a rich, emotional experience as well. Spend some time with Chad's new album. I'm sure that you will be glad you did.